The truth about barbeque grills is that they can become extremely greasy and dirty. Next, a common problem that owners face is that they really hate to clean them. At The BBQ Cleaner, we have found that there are still insufficient outlets for grill owners to have their grills professionally cleaned. That’s why we need more hands on deck, in states like West Virginia. We are looking for interested entrepreneurs who share our vision. If you are looking to start a business in West Virginia, you should definitely check out our proven business opportunity. When you have decided to join our rapidly expanding network of BBQ grill cleaning experts, you can rest assured that we will lead you every step of the way. Whether you require business supplies or training, we have got you well covered. We can even deliver customized marketing materials to your door! Apart from the convenience of running a business like this, the initial start up cost is extremely affordable. You will be able to become the entrepreneur of your dreams without breaking the bank. Why Start a BBQ Cleaning Business in West Virginia? Positive Weather Conditions: The summers are warm and not too hot. It is one of the best times throughout the year where families tend to be outside for a barbeque. This shows that there will many individuals needing grill cleaning services. Expect Repeat Business: You can expect to build a strong customer base where customers keep coming back every year. Expect Minimal Competition: You are providing a unique service in West Virginia because hardly anyone wants to clean greasy and dirty BBQ grills. Incredibly Scalable: As more people get to know about your grill cleaning services, you can easily grow your company in West Virginia by hiring more passionate staff members and vehicles. How Does The BBQ Cleaner Help You Get Started in West Virginia? 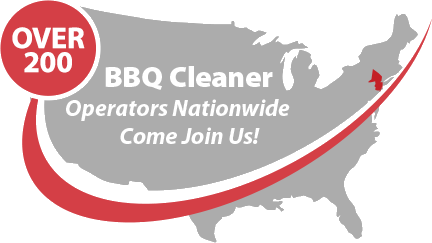 When you work with The BBQ Cleaner to start your own BBQ grill cleaning business in West Virginia, you are joining a network of over 180 operators throughout the United States. Our company is established in 2009 and we aim to help you grow your business successfully with low start up and overhead costs. As a global leader in the BBQ and grill cleaning industry, we are also able to provide on-going lifetime business support. Talk to us today to find out more about this stellar BBQ cleaning business opportunity in West Virginia!